The Bid Bag Beetleborgs is another one of those live-action series about costumed heroes that mixed footage from a Japanese show with original American content, like The Mighty Morphin Power Rangers and VR Troopers. I never saw it when it originally aired back in the mid-to-late nineties, but the first 27 episodes were recently released on DVD so I got to see it a couple weeks ago. I've already done reviews of Mighty Morphin Power Rangers Season 1, Volume 1 and VR Troopers: Season One, Vol.1 so now it's time to see how Big Bad Beetleborgs: Season One, Vol. 1 compares. This show features younger main characters from the other two show, with Drew and Roland being around 13 years old and Drew's little sister Jo being about 11 years old. Obviously these kids are not the actors in the Beetleborg costumes, but that's easily explained. You see, one day while the trio are in a haunted house they accidentally release a genie who grants them a wish, and since they don't really take it seriously they end up wishing to be their favorite comic book heroes, the Beetleborgs. And so this genie, named Flabber, turned them into Beetleborgs! They can still turn back into their normal selves, of course, and as kids they also each received a special ability. Drew got the power of telekinesis, Roland got super speed, and Jo got super strength. 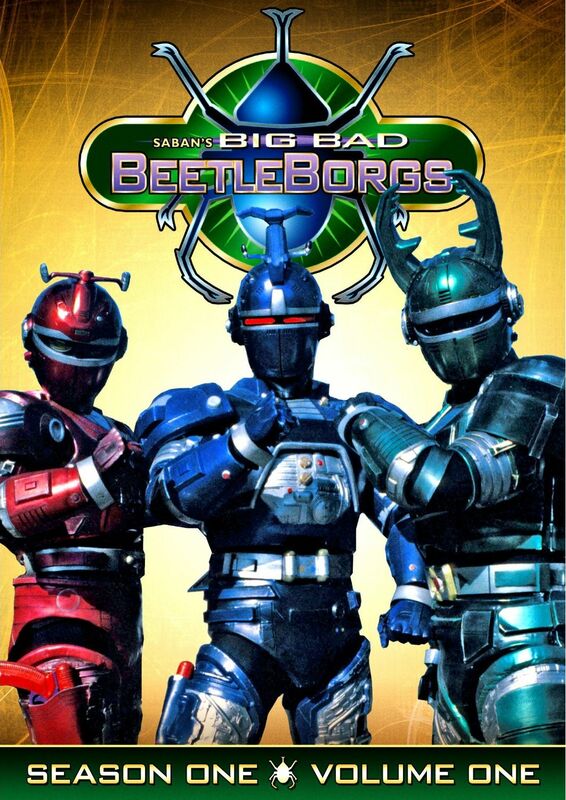 An unfortunate side effect of the spell that turned the kids into comic book heroes is that the villains from the comic were also released into the real world, and so the kids must constantly transform into the Big Bad Beetleborgs to defeat the evil villains. Now, this series is a lot more silly than Power Rangers or VR Troopers, but because of the younger cast it that actually feels natural. For instance, Flapper is kinda like a mix between Elvis and Beetlejuice, and also living in the haunted house is a trio of monsters, mummy, Dracula, and Frankenstein's monster, that are slapstick silly rather than spooky scary. It's actually not a bad show, though I think for me seeing it once was enough. Unfortunately there are no extra features.